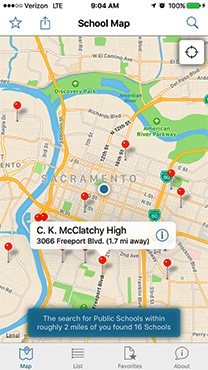 The CA Schools mobile application helps you find nearby California schools through your iOS or Android device. 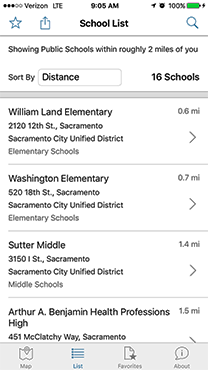 For non-mobile devices, use the School/District Profile Search or California School Directory to get information on California schools and districts. Find schools by physical location, custom map, county, school district, city, and zip code. Filter searches by school type (e.g., K-12, High Schools), school name, and type (e.g., Private, Charter School). Display search results as pins on an intuitive map view or as a sortable list view. Save favorite searches for later use. Share your search result through SMS message, e-mail, notes, etc. 1.1.6 (February 28, 2019) - Added support for finding schools with multilingual programs (a school with multilingual programs will include a link for more information under the Resources section of the details view). 1.1.4 (May 16, 2018) - Minor update for a change to the way Google handles map requests. Removed Districts from the search list that are inactive or contain no relevant schools. Updated direction action labels to include "To School" and "To District Office". 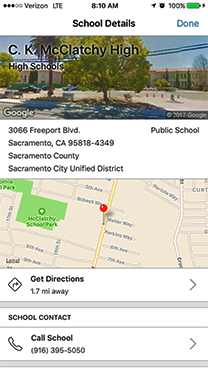 Added District info to the School’s Detail view (District address, phone, email, website, and Superintendent name, phone, and email). Improved the user interface or UI design of the Favorites view to be consistent for each platform. No longer showing proximity options in the Search dialog when user location is not available. More reports have been added to “View statistical reports”, and many of the reports are now mobile optimized. Improved the quality of some graphics (the splash screen image, action icons, and more). Fixed a bug where renaming a currently selected Favorite search did not immediately update the title in the Map and List view. Sped up network calls in the Details view. Proper vertical centering of the forward arrow in the List view items. Added length validation to our text controls. Added support for searching with some special characters (single quote and percent sign). Properly positioning the Detail view’s street view image in the center on larger screens. Improvements with upgrades to the latest Xamarin platform code. Improving the transition when asking for Location Permission on startup. Updated some icons to be in-line with iOS expectations. Fixed some icon sizes in the Details view. 1.0.4 (May 26, 2017) - Initial release of CA Schools. 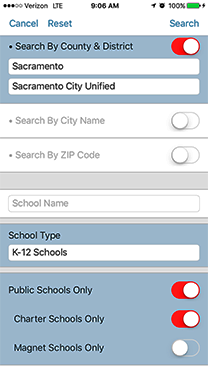 Support page for the CA Schools Mobile Application. State Schools Chief Tom Torlakson announces release of CA Schools Mobile App.